Fourier Tranform near infrared (FT-NIR) spectra have been measured for several globular proteins which vary widely in the relative amounts of different secondary structures. 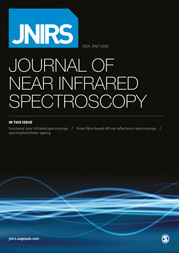 In order to assist in the interpretation of the NIR spectra in the region between 5000 and 4000 cm−1, FT-NIR measurements of silk fibroin with different secondary structures were also carried out. The second derivative procedures showed that the broad contour near 4610 cm−1 consists of several overlapping components and each relative intensity is significantly changed with the proteins. In particular, the band near 4525 cm−1 seemed to be a characteristic component of sheet structure. On the other hand, low-wavenumber NIR bands in 4500– 4000 cm−1 region were considered to reflect the amino acid compositions of proteins. These experimental data suggested that NIR spectroscopy can be used for structural analyses and characterisations of proteins. D.M. Byler, and H. Susi, , Biopolymers , 25, 469 (1986). W.K. Surewicz, and H.H. Mantsch, , Biochim. Biophys. Acta , 115, 952 (1988). A. Dong and P. Huang, and W.S. Caughey, , Biochemistry , 29, 3303 (1990). H.H. Mantsch, and D. Chapman, , Infrared Spectroscopy of Biomolecules. John Wiley and Sons, New York (1996). H. Zhang, K. Kaneko, J.T. Nguyen, T.L. Livshits, M.A. Baldwin, F.E. Cohen, and T.L. James, and S.B. Prusiner, , J. Mol. Biol. 250, 514 (1995). J. T. Nguyen, H. Inouye, M.A. Baldwin, R.J. Fletterick, F.E. Cohen, and S.B. Prusiner, and D.A. Kirschner, , J. Mol. Biol. , 252, 412 (1995). C.J. Barrow, A. Yasuda, and P.T.M. Kenny, and M. G. Zagorski, , J. Mol. Biol. , 225, 1075 (1992). E. Bramanti, E. Benedetti, C. Nicolini, T. Berzina, V. Erokhin, and A. D'Alessio, and E. Benedetti, , Biopolymers , 42, 227 (1997). M. Tsukada, Y. Goto, M. Nagura, N. Minoura, and N. Kasai, and G. Freddi, , J. Polym. Sci. Polym. Phys. Ed. 32, 961 (1994). M. Tsukada, , J. Polym. Sci. Polym. Phys. Ed. 24, 1227 (1986). M. Miyazawa, and M. Sonoyama, , Rep. Prog. Polym. Phys. Jpn. 40, 559 (1997). J. Wang, M.G. Sowa, and M.K. Ahmed, and H.H. Mantsch, , J. Phys. Chem. 98, 4748 (1994). Y. Liu, R-K. Cho, K. Sakurai, and T. Miura, and Y. Ozaki, , Appl. Spectrosc. 48, 1249 (1994). J.L.R. Arrondo and N.M. Young, and H.H. Mantsch, , Biochem. Biophys. Acta. 952, 261 (1988).